As women consider getting pregnant or already are pregnant they hear lots of bits of advice about what to do, how to raise their babies, what they might need. One piece that tends to not be as popularly discussed is the importance of nutrition in pregnancy. Every bite of food that we eat becomes part of our baby. Not everyone will agree on the best diet for pregnancy, but most health care professionals will agree on the basics: every pregnant woman needs folic acid, calcium, vitamin B and D3, protein and iron. While pregnant, the body works overtime to have a healthy pregnancy and baby. In order to do this the body needs to increase the mother’s blood volume. Typically, this blood volume will increase by 50-60% over the course of the pregnancy. Blood volume is increased when the liver makes albumin. Albumin facilitates the process of the body drawing fluid from her tissues and back into the circulating blood. But albumin can only be made by consuming protein. Salt will also help the body to draw fluid from the tissue. Natural sea salts are a great addition to a pregnant woman’s diet (as long as there are no kidney or heart issues). For this reason it is unwise to take a diuretic during pregnancy including those found naturally in herbal teas (nettle, dandelion, and alfalfa should be avoided). Over 50 years ago, an obstetrician named Dr. Thomas Brewer created “The Brewer Diet” for pregnancy. This diet’s goal is to help prevent preeclampsia and eclampsia but it’s beneficial for all stages of pregnancy. The basic plan ensures that women eat the right amount of foods to make sure their bodies have the nutrients they need to support a pregnancy. The Brewer Diet actually has 14 different groups of foods. For more information on any of these food groups consider purchasing the book The Brewer Medical Diet for Normal and High-Risk Pregnancy by Dr. Thomas Brewer. Milk and Milk products or if you are lactose intolerant look to increase your items from Group 2. Avoid soy as it can mimic estrogen in the body and is not recommended through pregnancy. “Calcium Replacements” from food items such as vegetables and nuts. Eggs each day cooked any style. Look for free-range, grass fed options or find a local farmer to buy your eggs directly from the source. Protein sources including meat, poultry, fish, and beans. Once again look for grass fed, free range. Fresh, dark green vegetables including broccoli, spinach, asparagus, etc. Whole grains including wheat, rye, bran and other whole grain options. Vitamin C sources including citrus fruit, tomatoes, strawberries and other sources. Fats and oils such as free range butter, olive oil, coconut oil, avacado and more. Vitamin A sources such as apricots or cantaloupe. Liver of beef, calf, chicken, pork or turkey. This group is optional. Salt or other sources of sodium. You want to look for natural sea salt options. Still needing more food? Feel free to consume additional servings from the first 10 groups. Natural, Whole Food Prenatal Supplements. As mentioned above it is very important for a pregnant woman to stay hydrated. Dehydration can lead to increased work for the body to make more blood and can increase blood pressure. It is important to remember that water is not the only source of hydration. Remember that fruits and vegetables contain water plus additional, necessary nutrients. During the later trimesters of pregnancy it is important for a woman to drink when she is thirsty and quench her thirst plus get additional fluids through food. The nutrients from food are vital to baby’s development. Dr. Elyssa recognizes the body’s ability to regulate all of the body’s systems. During pregnancy is it vital that a pregnant woman’s body can do what it needs to do without nervous system interference. Dr. Elyssa is certified to work with pregnant woman with chiropractic care and nutritional support. 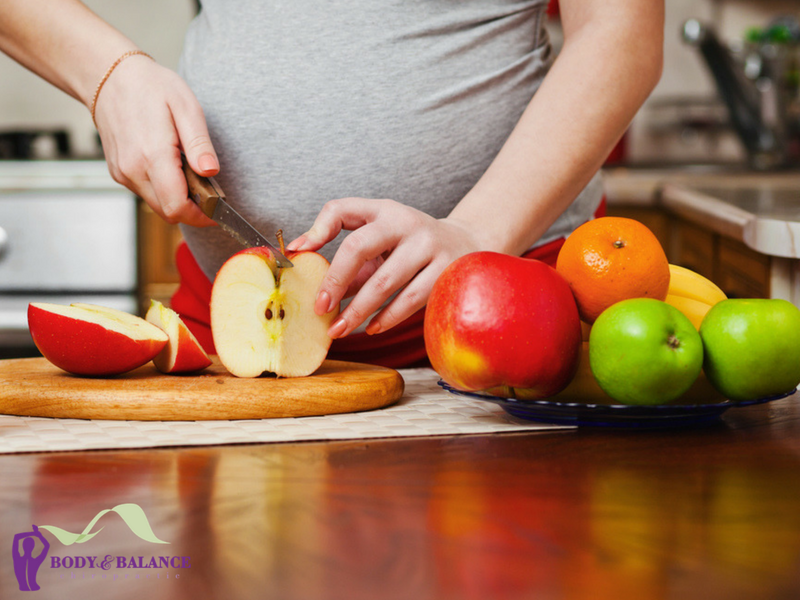 If you are concerned about your nutritional needs during pregnancy don’t hesitate to schedule a complimentary consultation with Dr. Elyssa to see if chiropractic care at Body and Balance Chiropractic is right for you. To learn more about meal planning during pregnancy, read the full newsletter here. The information provided in this article should not replace the consultative advice of your primary pregnancy healthcare provider.